When hunting, accuracy is everything, if you miss a short you could lose your prey or it could come running after you. That is why you need a reliable rifle hunting sniper scope. 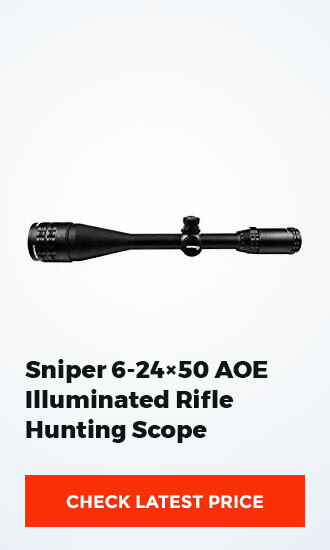 The Sniper 6-24×50 AOE Hunting Sniper Scope is that trusted scope for you that will add accuracy to your short with its clear view and sufficient magnification. The target will seem nearer and even a learner can easily hit the target while using this scope. There are some other features that it possesses which has made it the choice of a number of hunters. 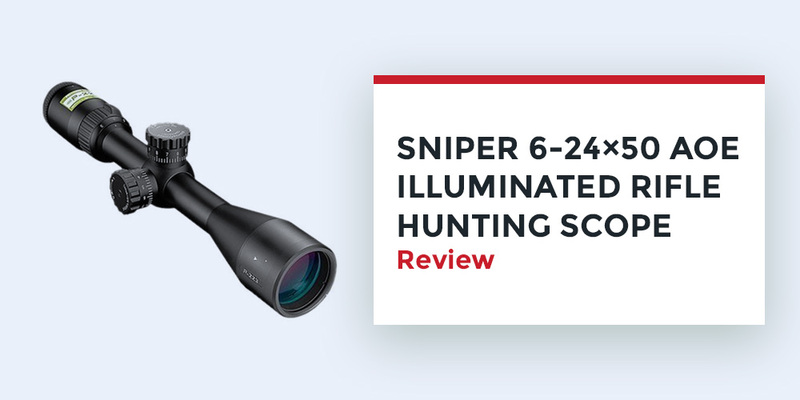 Here is Sniper 6-24×50 AOE Illuminated Rifle Hunting Scope Review. The place on which you connect it to your hunting rifle is easy to turn and adjust according to what you may want to do but that does not mean it will get spoilt easily. The one size fits all joint is made with the knowledge that hunting can be a rough sport. 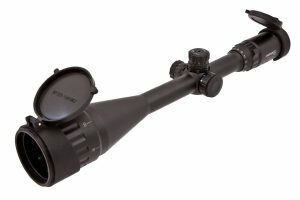 The Sniper 6-24×50 AOE scope can be easily and quickly adjusted to help you aim at a target within the shortest time. Many times while hunting you may find yourself in a situation where you need to take aim quickly and you need to be exact at the same time, the way that the scope is connected will make it easy for you to turn it round or lift it up quickly. The Sniper 6-24×50 AOE Illuminated Rifle Hunting Sniper Scope has extra lighting in red, green and blue which will help you see clearer in whatever condition. Bright light, darkness or misty conditions. There is a button on the side that can help you create this clarity while focusing to take a shot. The way it is made using nitrogen makes it water proof, fog proof and shock proof. This means that even when it is raining, there is no risk of it getting unclear because of water creating mist, neither will the magnifying glass break as a result of shock and they will not get fogy in the winter. The lenses are designed in a way that enough light gets through them. This is another feature the ensures clarity as it is never too dark, you are always able to readjust the amount of light entering the scope thus giving you better sight of the target it will also prevent reflection of light. The product is durable and able to take any kind of accidental shock. Q: Is the scope durable? Ans: Yes the scope is durable as long as you take reasonable care of it. It is made to withstand shock and weather conditions but that does not mean it should be deliberately scratched or exposed to heavy shock. Ans: Yes there are basic instructions for mounting it onto your rifle and the different parts are named so that it is easy to know what they do. Once you have mounted it on the riffle it should be east to just look through, adjust accordingly as you take aim and then fire once you have the target locked. Q: How far can it work? Ans: it is able to give you good vision up to 500 yards away, even people with poor eyesight are able to use it without developing headaches as long as they can adjust it accordingly, the 6-24×50 lens will give you clear magnification. 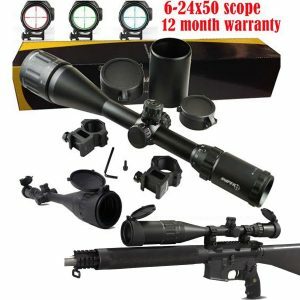 I recently bought one as a temporally replacement for one that had become old but after using the Sniper 6-24×50 AOE Illuminated Rifle Hunting Sniper Scope for 2 hunting trips, I have decided I do not need to buy a different one as this scope is just perfect for me.I would absolutely and highly recommend this to anyone looking for a reliable hunting scope.